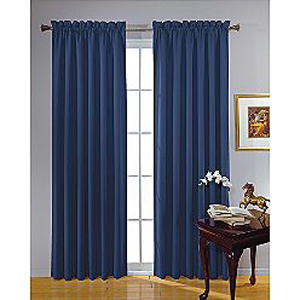 Blackout Curtains completely blocks out light, and lessens outside noise and extreme temperatures for a comfortable environment in any room at any time of the day. Great for bedrooms and living rooms. No need for separate curtain liners. Made of Canvas-weave. Fiber Content: Frong-100% Polyester and Back-100% Acrylic. Blocks 99% Of Light Two Sizes available. 56 In. x 84 In. 40 In. x 84 In.